This article is about alchemy labs used to make potions and poisons. For the player-built home addition related to the Hearthfire add-on, see Alchemy Laboratory. Alchemy Labs are places where it is possible to perform Alchemy. 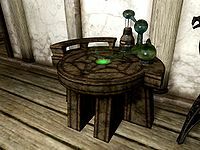 A category listing all places where alchemy labs can be found is available at Category:Skyrim-Places-Alchemy Labs. The player may clip through the alchemy lab, and appear to be standing in the middle. This has no effect on exiting or using the table. ? Sometimes after making many potions the lab doesn't let you select more ingredients. This is fixed simply by leaving it and then selecting it again. ? This page was last modified on 28 October 2018, at 06:08.